It's only been around about three weeks, but the free downtown St. Petersburg ride service is really catching on. 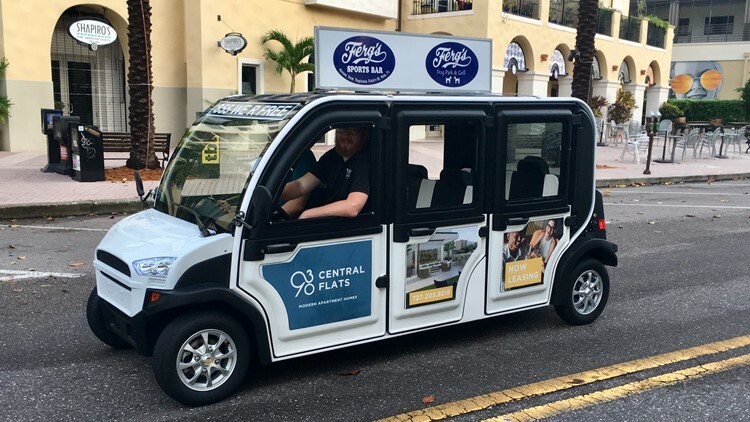 ST. PETERSBURG, Fla.— It hasn’t even been a month, and the free ride service that came to downtown St. Pete is taking off. Nickel Ride drivers have been keeping busy since the service launched August 3, said Natalia Harvey, the office manager at Nickel Ride. The Nickel Ride partnered with Ferg’s Sports Bar and Grill to help people in St. Petersburg get around easier. The popular downtown bar and grill will be the headquarters for the free ride service. “Ferg’s is the perfect hub. People are in there grabbing food and a drink and then we can get them," Harvey said. The bar and grill’s proximity to Tropicana Field was also a plus, she added. Harvey said the free ride service caught on more quickly in St. Pete than other cities. “We’re already taking off, and we’re not even in season,” Harvey said. The Nickel Ride started in Fort Myers the summer of 2017 and has since expanded to Cape Coral, Punta Gorda and now St. Petersburg.